Howdy from the great State of PA (yea, I know, but it's what pays the bills). I am a true newbie to the fun and am starting to collect the various things I need to bang & clang. Since I already had boots, hat, pants, vest, spurs, a 12 gage double barrel shotgun, and a nice pair of single action rugers (lived in Mississippi for eight years), all I really needed was a lever action rifle (the winchester I have is chambered in 30-30, great for deer, not so for Cowboy). I came across a new Winchester 73 and a new Henry Big Boy, both chambered in 38/357, the same caliber as my rugers. Any advise on which one people prefer? Nix on the Big Boy. only 2,127 SASS shooters use them while 46,755 use the '73. And remember - only 62.1% of statistics are true. No question, the 73 is way better for this game. You rarely ever see anyone shooting a Big Boy, and there's a reason for that. I VERY VERY seldom even see anyone trying to use the Big Boy. Between those two. It's not even a choice. 73. The negatives that I've heard about the Henry is that it is heavy. I'm not sure how well tested the new Winchester is. I've seen original Winchesters and copies (Uberti for example) but haven't heard much about the new Winchester. Ask around your local clubs and see if anyone has tried one out or better yet one you could test out. Has anyone here got experience with the new Winchester? I've got 4 Uberti's in the safe. One '66 and three '73s and no complaint about any of them. Edit - There are more than a few companies that sell race ready '73s & '66s. Not cheap, but they're ready to go and you don't have to put any more $$ into them. Don't jump too quick. Been there, done that. 73 without a doubt. everybody I've seen with a Big Boy fights them. they are clunky and heavy. I was one guy have the loading tube slide shoot out of the magazine and wind up down range. The 1866 Winchester (Uberti) is also a good choice. I have a 73 & a 66, I just like the 66 more. I like the brass. Where in the Magnolia State did you live? I lived near Liberty for about 5 years back in the early 80s. 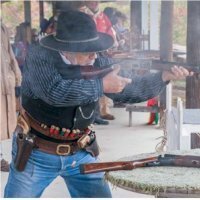 No question that the 1873 is the most "coveted" rifle and the choice of most of the top shooters (except for B-Western category where it is not allowed). The Henry Big Boy gets little favorable press here. I have seen the Henry used in local matches (in fact a member of my home club was shooting one yesterday) and they are certainly allowed and used, but it simply can't be run as fast as the '73s. Most of the '73s you see in the sport are Uberti reproductions. Winchester recently re-introduced an 1873 rifle that is made by Miroku in Japan. A couple have made their way into the hands of cowboy shooters and lots of folks are watching them with great anticipation. I don't know the "street price" of these rifles but I think the price is pretty comparable to a Uberti. Most cowboy rifles and shotguns have been "slicked up" or otherwise modified. There is a lot of aftermarket support for the Uberti reproductions but little or none so far for the new Winchesters. I am sounding like a broken record because I am always saying this, but I would encourage you to attend a local match and take a look at what other shooters are using. You will get a chance to handle the different rifles side-by-side and get a better idea of what might work for you. You may even find a used rifle for sale that is "match ready". It depends, do you like Ford or Chevy? I started SASS with a Henry Big Boy and would have no problem using one today IF..........................IF I didn't have designs on winning my category at every match I enter. They're very well made right here in the U S of A and Henry's warranty/customer service is second to none. I also liked the heft of the rifle. Some say they're too heavy but, I like my long guns to be on the heavy side. The flip side to that story, as I 've already pointed out, is that they simply can't be made to run as fast as a '73. So you have to decide what's important to you. There is also the good old 92. 1/2 the price of both guns. You can always find one used . They just about never fail. And most Pards cant out shoot them. If you CAN AFFORD to by a 73. That is your Best way to go. Interests:Life,Liberty,and the pursuit of the bigger Bang. First off welcome to the fire, second find yourself a club and go. don't buy a thing into you go and ask questions, most if not all cowboys will let you shoot their rifle. You will get a better feel for what's right for you. But as for the question of which rifle? My ranking would be 73 clone first, Marlin 1894 second, Winchester 92 third , any of the new pump rifles forth, big boy last. If you got the cash I'd would recommend a 73, used if you can find one. But before you do anything get yourself to a club asked questions. Try everything you can get your hands on. You may even find a cowboy with a good used rifle for sale. I was working the unloading table the other day when I saw a big boy. I asked the pard what he thought of it, and he said it was great. He told me that a few years ago they had mechanical issues but the company has done a lot to improve them. He said his never seems to break down and is fun to shoot. He loves it. Is it as fast as a Winchester 73 race gun. No. Not by a long shot. Does it deserve the bad press it gets around here. Based on what I have seen probably not. I would really suggest you go to your local matches. Take what you have if you wish. And let it be known that you want to try out several rifles before you buy one yourself. You will find that you will be offered more that enough guns to use, in fact you will have more than you can use loaned to you willingly. No rifle will run well right out of the box. From the factory you are buying a rifle similar to buying a car from a dealership. Great for around town and even on the freeway, just don't take it on the racetrack and expect it to keep up without breaking. Almost all rifles can be worked on to make them "race ready" and smooth. 1894 Marlins are very fast also, although the newer production ones are very rough. 1892 Winchesters and Rossi take a lot of TLC to make them smooth and reliable. Henry Big Boy are the smoothest out of the box but have the least after market speed parts. It may take a few matches for you to try them all. Make sure you do before you spend the bucks. All the rifles have their own feel. Even the same model can feel very different depending on how it is set up. Please offer to pay for the ammo, even though most of the time your offer will be rejected. First off, welcome to the SASS Wire, lots of good advice may be found here, as well as some of the nicest folks you'll ever meet. Secondly, where in PA are you from, so we can point you in the right direction to your local clubs? If you're in the SW PA area, come check us out at Logans Ferry Regulators, matches held on the second Saturday each month. Thanks for the reply Sgt.John. I moved into an area called Lansdale, which is just north of Philadelphia. From the website, there are about 10 clubs no more than an hour from me, including New Jersey. I went to the PA State Championships and had a great time just walking and talking. I have shot IDPA and other modern hand gun events for years but always fall back on my single action SS Bisley Rugers, Just seem to be more fun to shoot. As I am getting older (61), my eyes are not as good as they once were and shooting for accuracy and speed is not my thing. What drew me toward Cowboy is the people (I just posted this afternoon and already have a wealth information), all you do is hit the steel (does not need to be in the center) and the chance to use true guns, not plastic. I will most likely get both rifles, just because I like the look of the Henry and its American made. About 70% of SASS shoot the Winchester/Uberti clones of the 1873. They can be made super slick and short stroked. Do yourself a favor and go straight to the 73. It will save you money and aggravation. and welcome to the fire. In most cases folks have some oddball thing they are getting but a Winchester? Id say give it a try, I have never even touched a NEW 73, I guess I kinda envy you. Get it shoot it break it in. Id bet if you have problems the factory would like to know..... and WE would too. Also any 73 tuner would probably LOVE to get it in on the bench and take a good look. Id like more details about a NEW Winchester, pix or whatever. Rugers are a good choice, they CAN be tuned to work every bit as well as colts. Colt just has the name. I have a colt or two myself. If you don't want that win 73, please let me know where it is. Email me or pm either way. Pick one you like. I suggest the 94 beats the 73 beats the 66. Interests:I love hunting and fishing. I am into boating. I am a member of the Beaumont Yacht Club. I just have a lil ole boat not a yacht. I am a school teacher in the Beaumont ISD District 3rd Grade. Nate Kiowa Jones is the 92 goto guy. Steve Young is his name. The 92 shoots nice and the price cant be beat. There are a lot of info on Slicking them up. Go for the 73, you'll never regret it! Buy it and go shoot! Forget going to a match first to observe, just go and dive in!!! I 'll be shooting one at a side match at EOT tomorrow. Mine is great for precision work. I bought it as my first CAS rifle and after six months was outrunning the mechanism. I'm not a top shooter. It's also difficult to clean BP residue out compared to a '73 or a '94. Borrow a Rossi and run it for a match before you buy one. Most of the bad press earned by the Henry company is due to deceptive advertising that turned off a majority of the SASS people. I think that it has a function as a hunting gun but not a SASS gun. One of our shooters has one that he likes but it did fail at the last shoot. I have a slicked up EMF 92 (Rossi) in 45 LC. It is really nice. The work was done by Nate himself. If I had to pick a light saddle gun for a horseback trip into the woods, I would probably pick my 92, especially if I was also toting a 45 Blackhawk. It will handle any heavily loaded 45 cartridge. It is also great for home defense. Because it shoots pistol rounds it is better than a black rifle when confronting an intruder, but not as good as a shotgun. They work great for new shooters in CAS for a couple of years. Then many people can lever faster than the 92, and they gravitate to the 73. It is a much better all round firearm than the 73, but just not in our game. I am not one of the guys who says go straight to the 73. A new shooter needs to start shooting and then make up his mind as to what he wants for the long haul. A 92 will get you into the game for a lot less money, and you will have a great all round gun to boot. I have a slicked up, short stroked '73( by Cowboys & Indian Store) and a '92 slicked by NKJ. When I first developed an interest in cowboy shooting I did some shopping in local gun stores and figured I'd buy a Brazilian 1892 rifle. I'd seen them used in almost every Western movie and TV show. How could "The Rifleman" and John Wayne be wrong, plus is a John M. Browning design and much newer and more refined than the earlier rifles, right? I went to my first match before buying anything. I was able to handle and try out just about every variety of lever action rifle used in the sport. The first rifle I tried was an 1892. The gun had been 'smithed and the owner gave me ammo that was tailored for the rifle. It locked up tight on the first stage so I laid it down. Later in the match I tried it again. It jammed up so well that the owner was leaning into it with a Leatherman tool last I saw it. That was the end of my interest in the '92 as a match rifle. I wondered why so many shooters were using 1873 rifles. Older, outmoded design. Then I cycled Cowboy Junky's short stroked, slicked up '73. Then I understood. I went home and started saving my nickles for a '73. Would just like to say. My dislike of the Big Boy for SASS. Does NOT have anything to do with the company. I like the company. And have 4 of there Golden Boy .22's. It comes from what I have seen. And the ones I tried. make it through without problems. Now granted. I probably don't see more than one or two a year anymore. And I shoot around more than the average SASS member. That statement is 100% true...75% of the time! I've seen only used at club matches, mostly by new shooters who haven't competed for any length of time. It is a bit heavier, runs a lot slower compared to a slicked up '73, harder to load on the clock, but it is a serviceable rifle for beginners. I never see them at major matches and would recommend a good '73, since then you'll only have to buy 1 cowboy rifle. Something you should know. Up until 7 or 8 years ago you hardly ever saw a 73 at a CAS match. Now days people will tell you that you have to have a 73 or 66 but they don’t always tell you that you also need a premium action job and the short stroke parts for that 73 to be competitive. Before the short stoke guns the 92’s and 1894 Marlin were the top guns. I've seen only used at club matches, mostly by new shooters who haven't competed for any length of time. It is a bit heavier, runs a lot slower compared to a slicked up '73, You are comparing an out of the box rifle against one set up to run at race speed. And yes they can be made to run fast. At least as fast as any 92.
harder to load on the clock, Really? Just throw the round in the open hole and close the lever is slower than - Close the action, shove the round in the loading gate and then cycle the action. Marlins must be terrible to load on the clock too! but it is a serviceable rifle for beginners. No rifle is SERVICEABLE for a beginner out of the box. They all have their quirks. I never see them at major matches and would recommend a good '73, since then you'll only have to buy 1 cowboy rifle. I sure hope the gentleman doesn't want to shoot B-Western with your recommendation. And with no discussion about caliber either. A good tuned Marlin can still run with the best of them. My recollections differ. I have had a 73 since 2001 and they were very common at that time as were 66's. Saw occasional 92 reproductions, very few real Winchester 92's. Marlins were fairly common and you still see quite a few. You got that right Al. Some of the speeds and proficiency in some of our rifles has alot to do with the operator and their experience (or lack thereof) in shooting that rifle. There are some fine Champions out there shooting some good Marlins. The biggest problem with Marlin right now is the recent reputation by Remington. They are few on the shelfs and those of us who own them are not going to let loose of them. Nate, the North Carolina cowboy ranges were full of '73s when I started in 2001. Early 2001, I had a 20" '73 in 45. 2002, went to a 38. Mentors were Lone Dude, Harlan Wolf, Splinter Hauser, and others. And you are so right with the short stroke. At matches the newbies will come over and ask the rifle question. When you get down to the details today, Cody and Longhunter are banging on $1500.00 out the door. You can see a lot of hope crushed when you state this. Nevertheless, the '73 is king. The difference is what WidowMaker said. The shooter, evidenced by Deuce Stevens. The Henry, the 92, and the 94 are great functional weapons but........when you examine the engineering, the 73 works easier. Tuned, it is hard to describe. The 94 cannot be tuned even close.